Everything is ready to go and the 88th MLB All-Star Game is tomorrow night at Marlins Park in Miami. As per tradition, Terry Francona of 2016 AL Champion Cleveland was originally scheduled to manage the Junior Circuit. However, Tito underwent surgery last week to correct an irregular heartbeat. His bench coach Brad Mills will fill in for him, opposite Joe Maddon of the 2016 World Champion Chicago Cubs. This afternoon, Mills and Maddon announced their batting orders and starting pitchers. Each of the two starting pitchers receive the honor for the second time in their career. Mills hands the ball to Red Sox ace southpaw and Florida native Chris Sale, who started last year in San Diego as a member of the White Sox. He is the first pitcher to start consecutive All-Star Games since Randy Johnson in 2000 and 2001, as well as the first to do so with different teams. The NL too makes All-Star Game history with Maddon’s choice. He has given the nod to reigning NL Cy Young winner Max Scherzer. The stud righty for the Nationals started for the AL in 2013 as a member of Detroit, making him the fifth pitcher to start for each League (fun fact: Sale relieved him in that game and earned the win). As many were probably expecting, Maddon also named Miami’s Giancarlo Stanton the NL’s DH, making both of the Marlins’ representatives starters. 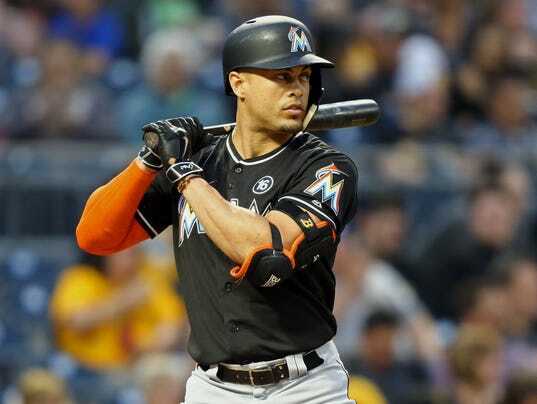 Marlins super-slugger Giancarlo Stanton aims for two types of history in tonight’s Home Run Derby. Photo by USA Today. The Midsummer Classic is tomorrow night at 8:00 ET on Fox. I can’t wait, can you?